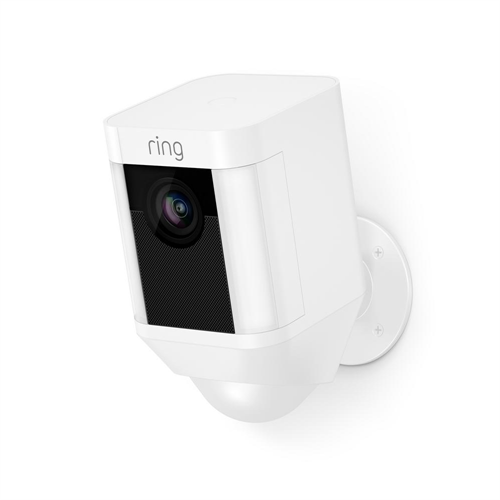 Secure your home with Ring’s battery powered Spotlight Cam. This wireless outdoor camera records in full-colour 1080p HD during the day and is equipped to work round the clock no matter how dark it is with built-in infrared night vision and LED spotlights. The motion sensor can be adjusted to find the ideal setting for your home to cover only the distance needed. The camera’s built-in microphone and speakers allow for a 2-way conversation in addition to Live View video in case you are not able to immediately make it to the door. The camera also includes a 100dB alarm that will activate upon suspicious activity, adding another layer of security to your home. The package includes a drill bit, installation screws & anchor, micro USB charging cable, owner’s manual, a white Ring Stick Up Cam Outdoor HD, wire-free security camera, screwdriver bit, screwdriver handle and security mount. The rechargeable battery pack can be easily swapped out when power is running low to ensure continued functionality.